Midnyte Reader: Author Interview with J.H. Moncrieff (The Bear Who Wouldn't Leave). Author Interview with J.H. Moncrieff (The Bear Who Wouldn't Leave). What is "The Bear Who Wouldn't Leave" about? Short answer? It's about a young boy's struggles with a cursed teddy bear. Deeper answer? It explores how it's human nature to be afraid of things we don't understand, and how that fear often triggers a very negative reaction. I'm inspired by travel. Almost every trip I've taken has resulted in at least one novel idea. Often, it’s a 'what if' question that inspires me. I usually feel like I haven't chosen the topic so much as it's chosen me. 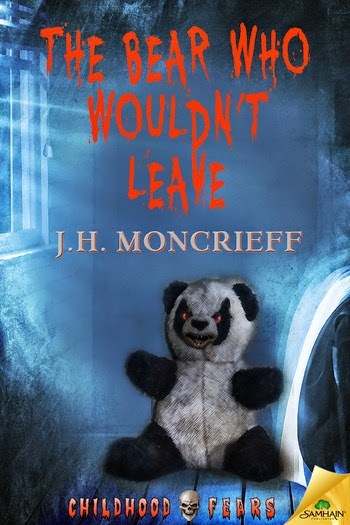 Would you consider "The Bear Who Wouldn't Leave" the darkest book you've written? Has it been the one that has affected you the most? I don't know if it's the darkest, but it's quite disturbing in a lot of ways. I didn't expect Josh's relationship with his stepfather to get as ugly as it did. Part of me was afraid it would be too dark for Samhain, but I had to be true to the story and the characters. I have what I like to call an 'organic' writing process. I'll get a bit of an idea from something, and within a few days, a character will show up and start telling me the story. My job is to write down what the protagonist says as fast as I can. Maybe it's my journalism background, but I'm a stickler for accuracy, which can often mean a lot of research. Thankfully, I've found a professional researcher I can rely on, so I no longer have to spend weeks searching for details like whether or not slaves in 1700s Dutch Caribbean had pillows, or what dental care was like in ancient Egypt. From my very first professional novel, I relied on experts--I have a list of cops, firefighters, stunt drivers, forensic anthropologists, and even oilmen I can count on for fact-checking. My first books were epic tales of a fish family who lived in terror of a bear that stalked them under the ocean. (Apparently I've got a thing for bears!) I was five when I wrote that series, and hopefully I've learned about a little thing we call 'suspension of disbelief' since then. I think I used to fall into lazy writing when I was younger--characters that were caricatures, settings that were non-existent, etc. I strongly believe it's our job as writers to always push ourselves to be better than our last story--as long as we don't slip into the perfectionism trap. I love Stephen King, of course, but also Susan Hill, Daphne du Maurier, and the occasional John Saul. Barbara Kingsolver, Timothy Findley and Elizabeth Berg are my favorite literary writers, and I love Joanne Fluke's cozy mysteries. When John Douglas releases a book, I have to buy it--he's one of the first FBI profilers and one hell of a crime writer. I also love reading memoirs, non-fiction accounts about dark times and events in our history, and cookbooks. "The Ruins" by Scott Smith. I was surprised by how good that book was--it's simply brilliant, and very creepy. I also read a couple of short romances by Elle Rush--"Leading Man" and "Candy Cane Kisses." I don't usually read romance, but I quite enjoy her books. Horror is very freeing. I've written mysteries and suspense thrillers, but in those genres, readers expect the guy to get the girl (or vice-versa) and the hero must triumph in the end. I love that calling something horror means you can do whatever you want and get as dark as you like. If a reader picks up a horror story, they know that anything can happen, and that's pretty exciting. Since I never know how my own books will end, it's best to call them horror. That way, no one is disappointed when things get nasty. I'm working on a new twist on the sea-monster myth and a series of horror novels set in ancient Egypt. J.H. 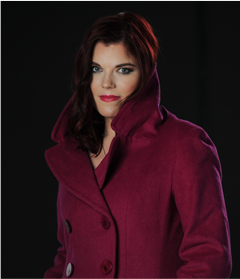 Moncrieff loves scaring the crap out of people with her books--when she's not busy being a journalist, editor, book doctor, and publicist. In her "spare" time, J.H. loves to travel to exotic locales, advocate for animal rights, and muay thai kickbox. I love The Ruins and the authors you mention, but I've never heard of Barbara Kingsolver. A quick search reveals that she played in Stephen King's band, along with Amy Tan. Cool! Which book of hers would you recommend as a starter? I really like what you say about fearing what we don't understand. Poisonwood Bible, most definitely. It's one of my favourite books! I love that J.H. Moncrieff has a system in place for research. Some stories seem to be able to get away with a little stretching here and there, but when a story is well researched, it really does make a difference. Some of the best fiction, makes you feel like it's real. Thanks so much, Toinette. Yeah, I can't just wing it with my books, as much as I would like to. If I'm writing about a period in history, I'm obsessed with getting the details right. Sometimes this results in some pretty fascinating stuff. For instance, I didn't realize the ancient Egyptians had working plumbing! Or that west Africans had their own form of "voodoo dolls" which they believed could capture the souls of evil people. Life is stranger than fiction! Why not use it? J.H.-It is fascinating! The ancient Egyptians also had anasthesia -- how cool is that! ?